Bhopal : Chief Minister Shri Shivraj Singh Chouhan said that 25 percent posts would be reserved for guest faculty in the teachers’ recruitments. There will be a separate examination for them. Sports teachers will be included in the recruitment of teachers. Sports period will be mandatory in schools. Commission will be constituted for change in the current education system. Teachers who have completed thirty years of service will be given third time-scale pay-scale. Changes will be made in the designation on the basis of seniority. The categorized system of teachers will be be made integral. Shri Chouhan made these announcements while addressing a state-level teachers’ felicitation ceremony today organized at the Model School, T.T. Nagar by the Directorate of Public Instructions. CM Shri Chouhan said that the contribution of Gurus is incomparable. While teachers show the right path of living to students, their guidance can make or destroy their life. Teacher is the spine of Rashtra Nirman, therefore teachers should be selected carefully. Teaching is an art in which the importance is not of figures but of the yearning to teach. If teacher makes education his mission, he will not pay attention to facilities, salary etc, it is such teachers who build a nation. On government teachers, he said teachers teaching in far-flung areas without facilities are working wonders. Children hailing from Mandla, Dindori, Dhar districts and belonging to Baiga tribe are getting selected in I.I.T and I.I.M.. More than half of government school children are under the laptop distribution scheme of the government. He said the teacher teaches the art of living and gives us new life. Several epics are full of the glory of Gurus. On the alternate teacher case he said that such rare incidents are a matter of shame for the entire teaching community. The Chief Minister called for removal of such wrong persons from the society. They should be committed towards building the future generation according to the making of new India. All arrangements for a respectable life for teachers will be made. Government has kept a budget of Rs 20 thousand crores for education. Stressing on the need for change in education system, the Chief Minister said that education should not depend on the state. The system of education should be based on society. Teacher should not be dependent on anyone. Stressing on the need of pondering on the changes he said initiative must be taken in this direction in state. The system should be such that there should be no dearth of funds and education should be the responsibility of the society. Making of the education system should not be the work of political leaders or the government. 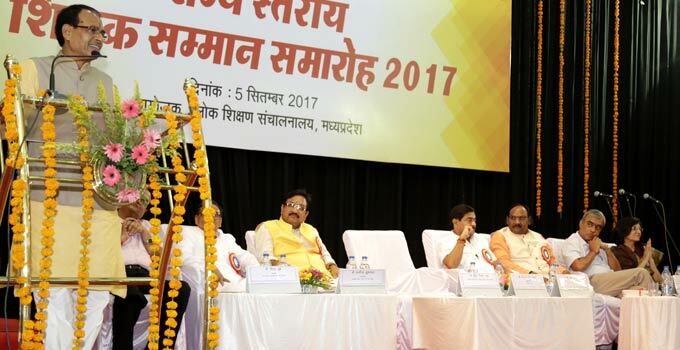 While referring to the degradation of education system, Shri Chouhan told for inheritance of chaotic condition of the system like Shiksha Karmi and Gurujis at the bare minimum amount of Rs. 500. He mentioned that efforts are being made constantly for improvement. Describing the education system of ancient India, he said that teacher of Kouravas and Panadvas Guru Dronacharya had asked for thumb of poor Eklavya under the state sponsored education whereas equal education was provided to Krishna and Sudama at Ujjain Ashram of Guru Sandeepan under the society based system. Moreover, Shri Chouhan stressed on need for deliberations while giving example of best system of community based schools. Shri Chouhan mentioned that he is participating in the programme as an ex-student and he has pursued studies in class 9, 10 and 11 in this school. He has gained a quality of leadership from this school only. Referring to the president election of students union, he said that names head boy and head girl prevalent currently do not attract him. Remembering the former students, former teachers, Shri Ratanchand Jain, Shailbala Madam, Kashyap Sir, Koushik Madam, Telang Sir, Arora Sir and Bari Sir, Shri Chouhan stated that these teachers have developed his personality. Mentioning about his deep respect towards the teachers, he apprised himself about the sports arrangements and study tour and remembered incidents of Goa-Mumbai tour with bus drivers Rafique Bhai and Jameel Bhai. He was informed that a team of students are being sent for tour to Wagah border. Chief Minister Shri Chouhan told the parents to give a thought on how they want to give life to the children. Do not make children like machines. Let natural and healthy development take place. Shri Chouhan while referring to the incidents of suicides due to frustration and western impact said that efforts are being made to impose ban on blue whale game. Parents, family, society and government all are responsible for this condition of children. He told for initiating step to eliminate the bags’ burden by making a team of teachers. 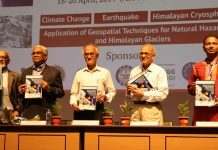 Mentioning about the global environmental challenges of the present time, Shri Chouhan told not to play with nature. He said that fear prevails when nature plays. Minister for School Education Kunwar Vijay Shah said that a Women Sanskrit school is being opened in the state first time. Books on information about all the festivals of all the religions, societies and sections beside life character of Pt. Deendayal Upadhyaya and story of Tiranga have been prepared. Forty thousand teachers will be recruited soon. Efforts are being made to construct computer lab., smart class and air conditioned auditorium in all the school of excellence. Constant efforts are being made to provide good academic atmosphere to the students. Minister of State for School Education Shri Deepak Joshi urged the teachers that 90 percent and 15 percent result at different places is utmost worrisome. Concrete efforts are required to end this. He further mentioned that steps are being taken to bring all the teachers on one platform. Teachers should commit themselves as not employees but as the builders of the state. Minister of State for SC-ST Development Shri Lalsingh Arya mentioned that honour to teacher is like an honour to school and their devotion. Good students will build new India. Referring to the efforts made by the state government for qualitative education for children belonging to poor and weaker section, he said that students of remote areas and poor are pursuing studies abroad today. Principal Secretary School Education Smt. Deepti Gour Mukherjee informed that these honours have been conferred to the teachers who have contributed their best in class education, sports training, girls education and school upgradation. She further informed that a platform is being made available soon for teachers to share views, experiences and problems in which the teachers themselves will provide solutions to the problems. Teachers are foundation pillars in the education system. An advance training programme has been prepared for their skill development to enable them to cooperate actively for enhancement of inquisitiveness among the students. In the programme, 13 teachers were honoured with Rashtriya Shikshak Puraskar 2015, 51 teachers with State level Shikshak Samman-2017 and teachers who have bagged first, second and third positions in Rashtriya Shikshak Sangoshthi. At the beginning programme was inaugurated by garlanding idol of Maa Sarswati and picture of former President Late Sarvapalli Radhakrsihnan and lighting a lamp. Chairman Board of Secondary Education Shri S. R. Mohanty, vice Chairman Shri Bhagirath Kumrawat, teachers and eminent citizens were present in the programme.